The Nets are coming into this game on a 3 game losing streak. It’s clear they desperately need a win, and they look for one as they host the Utah Jazz, who are also off to a slow start this season. Speaking of slow, both teams had a terribly slow start to the game. The first quarter was filled with missed shots, sloppy offense, and downright bad basketball for both teams. The Nets closed the first quarter trailing the Jazz by 1, with 16 points, a season low for the quarter. The 2nd quarter was redeeming for the team as they tightened up on the offensive end, scoring 26 points in the 2nd quarter and ending the first half with 42. The aggression carried over in the 3rd quarter as they outscored Utah 36-27. Spencer Dinwiddie was the reason the Nets remained in the game, as he scored the Nets last 16 points late in the 3rd. But it all unraveled in the 4th, as the rest of the team could not find their rhythm. The Nets would only score 13 points in the 4th quarter as Donovan Mitchell would out score Brooklyn by himself scoring 14 points down the stretch. The Nets would not recover as Utah takes a road win, defeating Brooklyn 101-91. D’LO scores Low! !- D’Angelo Russell shot 24% from the floor. While he finished with 14 points, it was a very inefficient night for Russell. Going 6/25 on the night. Jefferson Starts Again! !- Rondae Hollis-Jefferson made it into the starting lineup once more, for obvious reasons. Utah is a much bigger team and they need bigger bodies down low, especially with Rudy Gobert on the floor. He would finish the night with 14 points and 11 rebounds. Turnover City! !- As if the low scoring first quarter wasn’t enough, The Nets would put up their lowest scoring game of the season; while also committing 20 turnovers in the game. Dinwiddie Takes Over! 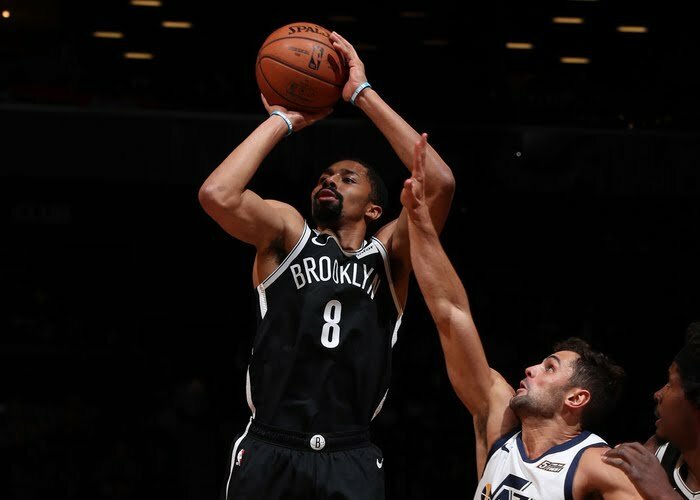 !- Spencer Dinwiddie would give the Nets 16 straight points late in the 3rd to help the Nets take an 11 point lead, but that would not be enough to seal a win as he fouled out in the last seconds of the 4th quarter and watched his efforts slip away. You Must Close to Win! !- The Nets’ inability to close games continues to haunt them in these gut-wrenching losses. Their 4th quarter woes would lead to this loss; 13 points in the 4th quarter is downright unacceptable and wouldn’t be anywhere near enough to win the game. Utah would outscore the Nets 31-13. Keep the Ball Moving! !- The Ball movement was pretty low. With only 11 assists, the ball was clearly stuck. The Nets have work to do as they play against Memphis on Friday.